Year 4 have written some brilliant myths and legends. They included great action and detail as well as ambitious vocabulary. They read their myths to three friends and enjoyed listening to and discussing each other’s writing. moving onto handwriting pen in Year 4! What were your think pinks? Spring 2 - 18.1.18 Our Year 4 pupils enjoyed some cross curricular writing about the Anglo-Saxons. They demonstrated brilliant historical knowledge to write in role to show the viewpoints of a Roman, Briton, Anglo Saxon and a Pict. They also labelled a village using their knowledge from guided reading which will form detail for some historical fiction! GUY BASS author update - towards the end of last year our current Year 5 pupils created some posters to thank GUY BASS, the author of STITCH HEAD, for visiting our school. We sent a few of these to him and he loved them! So much so that he has been back in contact to say that he has included them on him website. Guy emailed Year 5 to say he thought their work was "ridiculously imaginative" and "greatly appreciated".Great effort! LKS2 Year 4 writers were really proud of the feedback they were given from their Let's Write task where they had to write a diary entry as STITCH HEAD. They are all keen to work towards their targets with spelling and sentence punctuation and they all really impressed us with their use of ambitious vocabualry and the way they all included character viewpoint. Keep up the great work! UKS2 Year 6 Wow! We loved how our Year 6 authors have been able to "Show not tell" in their writing in order to give their reader vivid images as well as building up suspense and humour for them to enjoy reading year 6's work! Well done for focusing carefully on the purpose of writing and of course your audience! 4.10.17 UKS2 - Year 6 have had a really busy start to their year. They have become grammar experts already in all things linked with sentence types and clauses, they have their own mind maps to help them to apply all of their knowledge when working in SPAG sessions or in their own writing. Mind mapping has also helped them to create cohesion between their paragraphs - You definitely look like SPAG experts so far year 6. LKS2 Year 3 have been very busy finding out about Adventure Stories and their settings. They have used drama to help them focus on characters and worked together to describe their own settings. Today they worked with a box it up plan to plan out a full adventure story - we can't wait to read them Year 3. KS1 Year 1 have been very busy with their new phonics lessons then working hard to apply their reading and spelling knowledge in their English lessons. Look at the range of forms, purposes and audiences they have been writing for... postcards,notes, stories, setting descriptions! Not to mention their reading work which gives them some great new vocabulary to include in their own work! Are you brave enough for Ghastly Grubbers Nubbin? Lots of green for successful work! Editing and marking is colourful business! KS1 20.9.17 Wow! Year 2 have made a really "SUPER" start to the term and have used their knowledge from guided reading to help them with ideas and language to plan and write their own superhero story. Year 2 have loved using a story map and talking the text to help them rehearse story language and layout. Lovely presentation too! We make links between our reading and writing! Welcome back to another great year of writing at Westerhope. As part of their work on Free Verse Poetry this term, Year 4 enjoyed reading 'The Sound Collector' by Roger McGough. They worked collaboratively to write and present their own versions, which we have posted off to Roger McGough himself! Let's hope he likes them! Year 4 have finished the Christmas term by reading the story "The Snow Queen", exploring use of language to describe setting and character before finally retelling thier own version with an individual twist at the end. 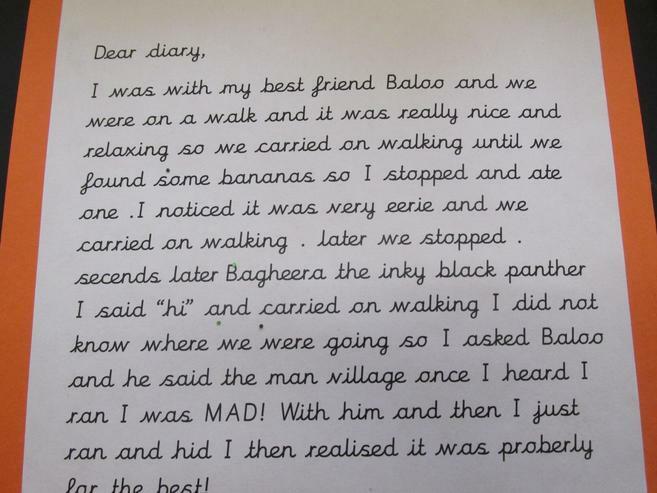 Year 4 teachers have beeen very proud of the progress the children have made with their story writing. They have also been extremely busy creating their own dragons to create some fantastic non-chronological reports to complete their topic linked to Beowulf. Keep it up. LKS2 enjoyed reading "The Donkey's First Christmas" before writing their own version as a comic strip. They had to think really carefully about the main events and character viewpoint. Some children even managed to add some humour! Well done. Year 5 have been working on their sustained writing. 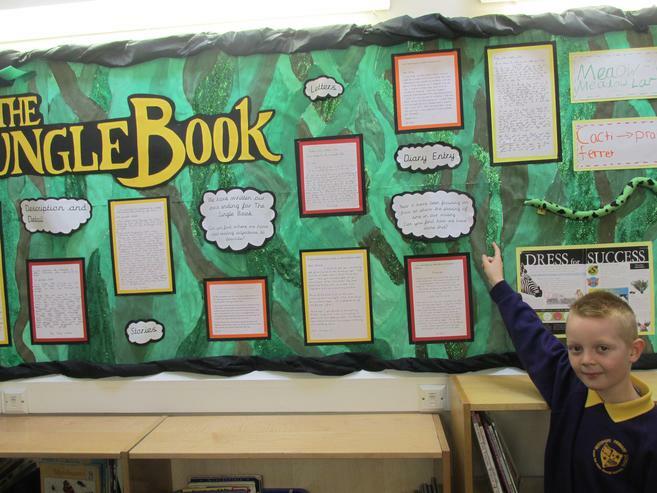 This learner is certainly able to write long and relevant texts! They also read examples of text types to analyse them before writing their own. Reading supports our writing across the school. Year 6 have also been busy publishing some of their writing in ICT. Do you think you would be persuaded by their adverts? Year 6 have been working on some top secret, classified files after reading one of our favourite class texts - Stormbreaker by Anthony Horowitz. Their writing about the story has been full of action and suspense. Well done Year 6! We are keen to show off our writing around school. 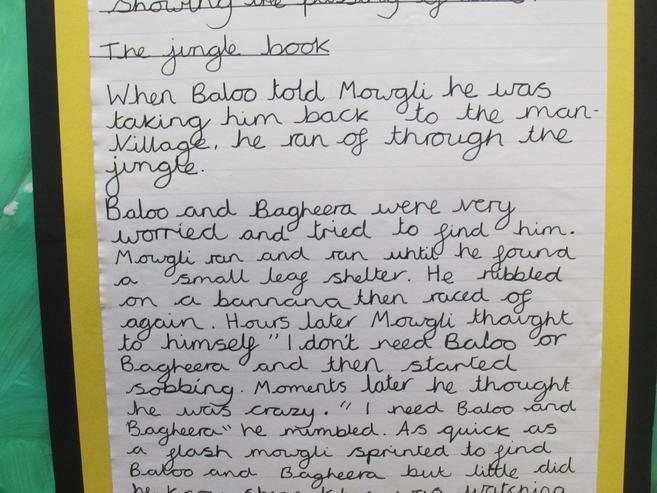 On this page you will see some excellent example -starting with the year 4 'Jungle Book' topic.